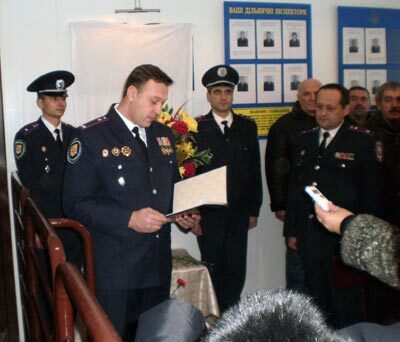 From now on in the foyer of the Komsomol city Department is a Memorial plaque in honor of Pavel Zavorotny – former head of the Komsomol city Department, a teacher and mentor of many generations of law enforcement, the founder of the best traditions of the Komsomol STATE Ministry of internal Affairs of Ukraine in the Poltava region! The criminal investigation Department of the Ministry of internal Affairs of Ukraine in Poltava region establishes the location of gr. Grigoruk Andrian Vladimirovich, 15.01.1980, a native and resident of Ivano-Frankivsk, vul. Sports, 30, 13.12.2010 years out of the taxi in front of the entrance to the city of Piryatin of Poltava region to the present time his location is not known. UKR UMVD of Ukraine in Poltava region established the identity of the unknown man, whose body was discovered 26.10.10 year in the forest near the highway Kyiv-Kharkiv near S. N. Fedorivka Chutovskoy district, Poltava region. UKR UMVD of Ukraine in the Nikolaev area is searched as missing LUNEV VLADIMIR VIKTOROVICH 25.09.1979. December 13, 2008 left home and never returned Kotsyuba Sergei Stepanovich (Kotsyuba Sergei Stepanovich), 09.01.1984 A., a native and resident of Poltava. Signs: 25 years old, height 175 cm, oval face, hair straight, light, short, eyebrows straight, lips thick, eyes light. 22 Oct 2008 went to work in the city of Vinnytsia and have no contact with family Shemilt Sergey Vladimirovich (Semilit Sergey Vladimirovich), 04.12.1967 year of birth, native and inhabitant of Novy-Sanjary district, Poltava region. Follow mia.pl.ua and always stay updated for the Poltava Ukraine News.